What Do High School Students Think About Peer Review? National studies tell us that most students experience peer review at least once per year, typically in an English Language Arts class. They bring a piece of writing to class, exchange it with another student, and respond to prompts to guide their classmate to write an improved second draft–anticipating that the comments they get on their own writing will help them do the same. What is less-often understood is whether students think that peer review benefits their writing. In our work with over 500 high school students over the past several years, we’ve found that, yes, students find peer review valuable and have a lot to say about what makes it helpful–and what can also derail it. In this post, we share what high school students have told us in questionnaires, classroom observations, and interviews about their experiences with peer review. These perspectives suggest that peer review helps students think about how to develop strategies for improving their writing and how to see their writing from the perspective of an external audience. In a follow-up post, we will make recommendations for teachers to design peer review experiences that respond to students’ perspectives. Students across schools and grades told us that they learned a lot about writing just from reviewing their peers’ papers. They used some peers’ writing as “mentor texts” to help them address their own struggles, such as how to structure a good explanation within a paragraph or how to clearly explain the mathematical process they used to solve an equation. They also recognized when the writing they were reviewing had weaknesses and viewed those essays as guides for reflecting on the areas of their own papers that needed improvement. Students saw peer review as a productive collective effort that provided more feedback than a single perspective could provide.Students want to know where they stand with their writing. We can all relate to the anxiety of turning in a paper and having no sense of whether it meets the standards of the teacher. Students told us that they appreciated getting more feedback from peers on a rough draft than one teacher could possibly provide. 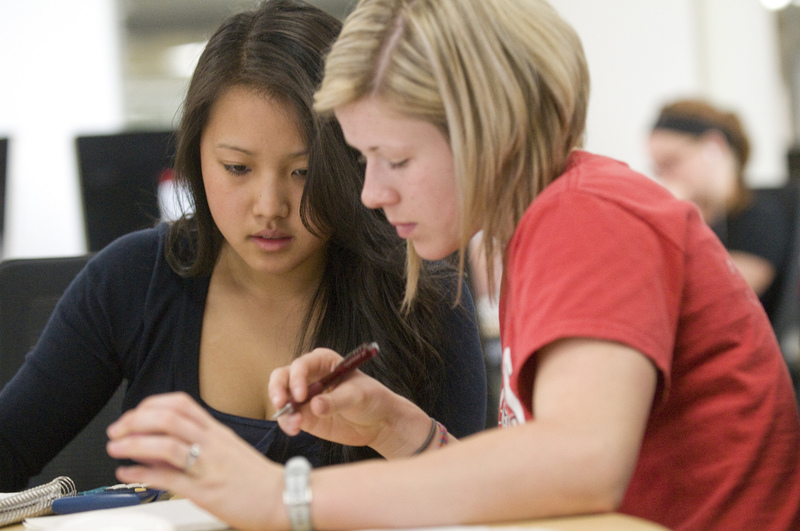 Students could gauge the strengths and weaknesses in their essays more accurately as a result. There can be a perception that students are not expert enough to provide effective feedback to each other. However, over 90% of the students we surveyed thought the feedback they gave was helpful to their peers. The students we worked with submitted feedback through an online system called SWoRD and used pseudonyms to keep both their writing and feedback comments anonymous. SWoRD is a grant-funded research-focused product developed through the University of Pittsburgh’s Learning Research and Development Center, whose core functionality is also available commercially as Peerceptiv. (None of the authors of this post have a financial stake in Peerceptiv.) The system operates on the same principle as academic double-blind peer review. We think it is telling that one of the key justifications many students gave for valuing anonymity, though not universally appreciated, was that it helped navigate social relationships. Sometimes that meant they could make the comments they felt were necessary without fear, and sometimes it helped remove some of the bias they may have had when receiving comments from a classmate; if they didn’t know who the classmate making the comment was, they took all comments at face value. Even in an anonymous virtual environment, students were creative in how they maintained social relationships, such as the student who told us she would include smiley faces after critiques in order to show that she was offering help. Other research in peer review, such Sarah Freedman’s, has shown how social face-saving and conflict avoidance negatively affect peer review. It is always a good reminder for teachers to consider how social relationships and goals can influence even “best practices” in writing instruction. To implement anonymous peer review, teachers don’t need a fancy (or expensive) online tool. We have seen teachers successfully use anonymous peer review with paper and pencil. Teachers can assign a random name or number to students to anonymize drafts. This particular method requires an extra step, but it is extremely helpful for students, particularly those newer to peer review who are still finding their footing and confidence, because it reduces social anxiety and helps students focus on quality peer feedback and revisions. Our research tells us that students value sharing their academic writing and receiving peer feedback. Even when not all the feedback they receive is viewed as helpful, student value the process of peer review, both hearing multiple points of view on their writing and giving feedback on their peers’ writing. If we listen to what students appreciate and are concerned about, we can help them engage in peer review productively and with confidence so they can learn about academic writing and about themselves as writers. Adam Loretto is an assistant professor in the Writing Program and English Department at Grove City College. His research focuses on sponsorship in writing and writing processes. Sara DeMartino is an English language arts Fellow at the Institute for Learning at the University of Pittsburgh. Amanda Godley is a professor of English Education and Language, Literacy and Culture at the University of Pittsburgh. Her research focuses on classroom talk, dialect diversity, and writing instruction in high school English classrooms. Peer response research has been pretty scarce in the past few years. Perhaps because the NCLB initiative and, later, the Common Core push, quelled teachers’ questions. What this study reports, in this version at least, meshes with some of my experience with writers and peer response. Yet, I don’t feel totally comfortable with it. It is a relief to see the reference to Sarah Freedman’s research linked here; contemporary researchers apparently decide that anything before 2012 is irrelevant. And, this research can be interpreted as an answer to her findings. I went to the Peerceptiv websites, etc., and could not uncover a bibliography for the report although I am certain there is one. What my surface search did indicate is that the instrument used was developed and is now marketed by the University w/which the researchers are affiliated. They do say they are not financially connected. l more thing — peer response discussions used to emphasize the idea of “audience” as a possible reason for its use. Audience isn’t absent from the use of this service, but it is definitely different. Does anyone have any comments about that?